At about 11 pm on June 22, 1977, gold prospector Albert Smith noticed three lights in the sky. Silently and slowly they moved down toward him and then nestled in a clump of trees near his camp. He saw figures emerge amid dazzling lights. 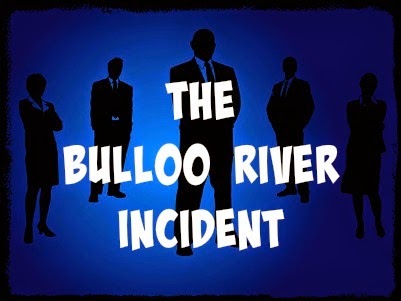 Thus began the most incredible, two days in the life of 47-rear-old Albert .... the two days In which he claims he was visited by people from another world at his lonely camp on the Bulloo River in far southwest Queensland. Be claims he spoke to the visitors, watched them play games with what appeared to be lightning balls, saw them disappear and then reappear and stood spellbound as the intergalactic travellers created instantaneous rain. Last week Albert recalled his meeting with the 35 men and women from a place they called Begua. He said: "It was in near freezing weather yet the women were wearing summer type clothing. "The men were dressed in what looked like grey businessmen's suits. "They all appeared very human but their skin was a blue-grey color. "Their craft were about 50 metres high, each with fire supporting legs. "The leader said his name was Behnar. When I touched him It felt like I was touching very soft rubber. "When I asked them questions they seemed to know what I was going to say before I said it "
"And I think they only permitted me to ask what they wanted me to. "I'm sure they had control of my mind for those two days. "I think their powers were almost limitless." Albert said the aliens could speak English but only in whispered tones. "They appeared to be able to communicate with their hands as well. "One woman told me she was 490 years old. She looked it too; like a mummy from some sort of Egyptian tomb. "At one stage they all started to play a gaaft with hundreds of these balls which seemed to throw out lightning. "These people could leap 60 metres in one jump. "When they left the only thing that remained was a very heavy smell of kerosene. There were no marks or objects left to prove their existence. "Just before they finally disappeared the leader told me he was going to make rain. A short time later it suddenly started to pour. "It was eight days before the rain stopped. "I wanted to see their craft taking oft but again I think they controlled me. "I was lying in bed and could not get up. It seemed like I had 200 kilograms of lead my legs." The June visit was the fourth experience Albert has had with visitors from outer space since he began prospecting hi the area five years ago. In the winter of 1973 he saw a fleet of 16 spacecraft hover over the area and then move away. In May the following year he approached a cigar-shaped craft hovering above the ground. He saw men in the cockpit and a woman at one of the windows. It sped away hi what appeared to be a flash of light. And in June 1976 another brilliantly illuminated craft appeared. Albert said: "I have not yet approached the authorities about this. "A lot of other things happened which I don't want to talk about at this stage. "No one will believe me until I get proof and that's what I intend to get as soon as I possibly can. "I will be going back to the area late February but this time I will have a camera. I have begun to document all these experiences. Gravity effect. three 50m UFOs land on 5 legs each. Blue human-looking UFOnauts exited. Close encounter with a craft and its occupants. Gravity effects. Three objects, about 150 feet across, were observed by one experienced male witness at a camp for two days. A humanoid, wearing a blue suit, was seen. Albert Smith, 47, was at his southwest Queensland camp when he observed three lights in the sky; they moved slowly toward him, descending into a copse of nearby trees, each one now seen as a cigar shaped object vertically inclined and sitting on a 5-legged landing gear. A large group of figures were seen emerging amidst dazzling lights. The witness claims that for the next two days 35 human like aliens visited him from a place called Begua. Their leader identified himself as Behnar. The being's skin was blue gray and the men were dressed in what looked like gray business like suits. One woman told him she was more than 400 years old. The spoke English but only in whispered tones, communicating by hand and telepathically, as well. They seemed to know what he was going to ask before he did. He felt as if the beings had controlled his mind during the encounter. Although the weather was freezing, they wore only light clothes; they stayed mainly by a nearby river, and played games with "lighting balls." They could disappear and reappear at will. When the witness touched Behnar, it felt like he was touching very soft rubber. When it came time to leave, the witness was not permitted to watch; he found himself immobilized. Just before the three craft departed, they told him they would make it rain; shortly thereafter it began to pour and continued for 8 days.